Cool! 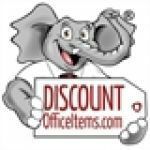 Save an average of 20% on Discount Office Items with 31 Coupon Codes, and 19 Deals! A site that offers an online catalog of office supplies, including furniture, electronics, supplies, and all of the other office essentials that you would need. Details: Get $5 OFF Envelope orders of $25 or more. Some exclusions apply. One use per customer. Ends 02/16/14. Details: Free Bic Stylus with orders $25 & over. Begins 11/18/13. Expires on 12/31/2013. Details: 15% off Cleaning & Breakroom purchases $100 or less. Starts 11/18/13. Expires on 12/31/2013. Details: Free Shipping on Orders over $45! Details: Free Shipping available on UPS Orders Over $75. All Other Orders Ship for $5.99. Details: Get $25 off Java One Premium Gourmet Coffee Portion Packs Colombian Flavor - 1.5 oz Size - 42 Packs/ Box. Details: Get $29 off safco vue extended height mesh chair. Details: Get $2 off HP MultiPurpose Copy Paper. Details: Get $1 off Acco rubber band ball. Details: $10 off orders over $125. Details & Exclusions: $10 off orders over $99. Exclusions apply. Ends 02/16/2014 Exclusions: Excludes sale items, items with custom/quoted pricing, purchase orders, paper, ink, toner or technology products unless specified. Details: 10% off a $150+ order. Expires on 01/30/2014. Details: Get Free Dozen Black Sharpies with $125+ order. Ends 02/23/14. Details: Get Free Business Card Holder with orders of $30 or more. Some exclusions apply. Ends 02/23/14. Details: 10% Off orders up to $150. Excludes ink, toner, paper and technology. Expires 11/07/13. Details: Get a dozen Bic Pens free with $25+ paper order. Expires on 02/02/2014. Details: Free Magic Eraser with your $50+ order. Expires on 02/09/2014. Details: Get $5 off label orders of $25 or more. Some exclusions apply. One use per customer. Ends 02/16/14. Details: Get 15% off Storage Boxes & Drawers up to $150. Some exclusions apply. Ends 02/23/14. Details: Free Danish Butter Cookies with your $100+ order. Expires on 02/09/2014. Details: Get $2 off Rolodex wire mesh spinning desk sorter black. Details: Get $2 off Lysol Spray To Go Disinfectant. Details: Get $5 off Purell Instant Hand Sanitizer Jelly Wrap Bracelet-Strap Bottles. Details: Save up to 58% off MSRP on select HON file cabinets. Details: $8 off AutoExec File Tote Bag, 600-Denier Nylon, 14 x 17 x 10-1/2, Gray/Black. Details: Get $35 off MSRP Acclaim C Fold Paper Towel 10.25" x 13.25" - C-Fold - 240 Sheets/Pack - 10 Packs. Details: Get $57 off Safco height adjustable split level drafting table. Details: Get $5 off MSRP Avery Round Ring Binder with Label Holder. Ends March 31, 2014. Details: Get $11 off HON 1870 Series Laminate Bookcase.